GOOD NEWS! K finally gets her free plush toy from Rustan's Supermarket. Naming it "Nana the Banana," this bright yellow fella from the Goodness Gang is part of the supermarket's campaign to promote healthy eating following the "5-a-Day Rule" among its shoppers. The 5-a-Day Rule comes from the World Health Organization's recommended serving of at least 400 grams of fruits and vegetables a day to lower the risk of developing non-communicable diseases (e.g. heart disease, stroke, diabetes and some cancers), among other health problems. By consuming five 80-gram portions of fruits and vegetables combined, one can get maximum benefits such as vitamins, minerals and dietary fibre, which helps maintain a healthy digestive system. 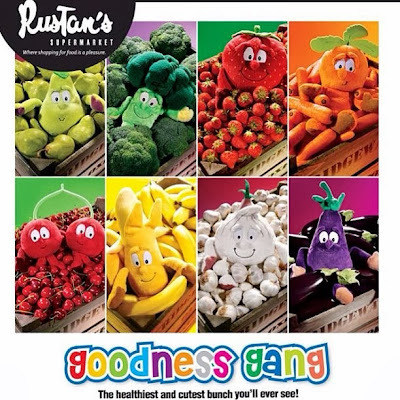 The Goodness Gang are here to help us follow the 5-a-Day Rule. Get one (1) sticker for every PhP 300 worth of purchase in Rustan's Supermarkets plus bonus stickers for a minimum PhP 100 worth of sponsor products. Promo runs until November 30, 2013. Sticker cards are available at Rustan's Supermarket cashiers and customer service counters or click here to download and print a copy. 2. NHS (UK): Why 5 a Day?